Henson had a fondness for the rebellious nature of rock and roll music. 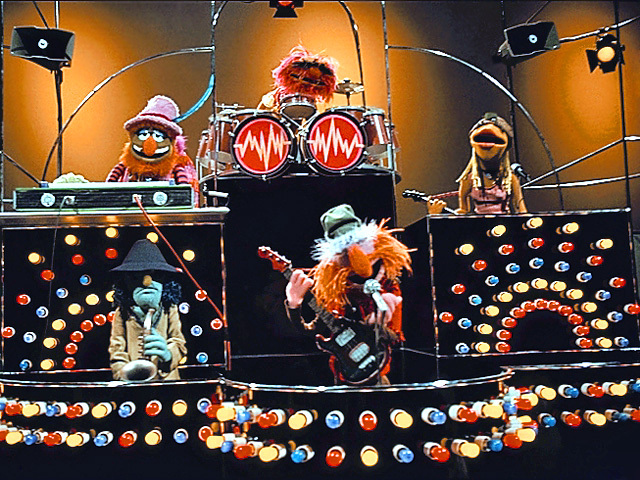 In creating The Muppet Show, he made sure to include the most outlandish rock and roll group he could think of. The Electric Mayhem was created as a hodge-podge of different rock musicians and styles, creating a unique looking bunch that could only exist in a fictional form. Each of the five main performers on the show were given their own character to perform. This week, we shall look at the parts of the whole that contributed to the Electric Mayhem's sound. First up is Jim Henson's proxy and the leader of the band, Dr. Teeth. 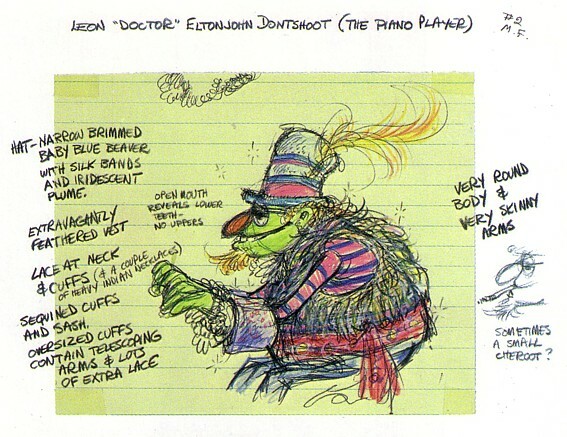 As you can see from the first sketch, Dr. Teeth was originally known as "Leon 'Doctor' Eltonjohn Dontshoot," drawing his inspiration from piano players such as Leon Russell and Elton John. But the biggest influence on the character design was jazz and zydeco enthusiast Dr. John. The following clip shows the original musician in his prime, and it is easy to see where Teeth's movements, voice, and language patterns came from. Dr. John represented the fringe nature of rock music and it was that break from the norm that Henson wanted to encapsulate. Dr. Teeth's band would perform the music that your parents thought was too loud and sounded like garbage. 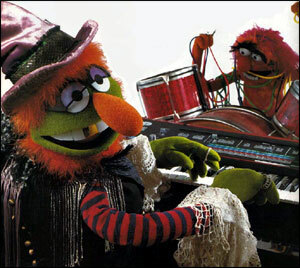 Even when given the task of performing classical pieces or sweet love ballads, the Electric Mayhem's rock nature always crept through. Although the band usually performed covers or backup music, original pieces were created, such as "Don't Blame the Dynamite," which neatly sums up the message of Mayhem. In this piece, Dr. Teeth encourages the listener to embrace the music and bring back the fun in their boring life. It seems directed at all of the old fogies who have forgotten what it is like to be young and are wondering where that spark of life has gone to. Teeth reminds them that the passion is still there and it is up to you to unearth it. Like the Swedish Chef, Dr. Teeth is another unique version of the two-person Live-Hand Puppet. In order to capture Dr. John's signature piano-playing hunch, long, extendable arms are attached to the body that droop when Teeth is close to the piano. To highlight this unique quality, Henson would enjoy walking as far away from the piano as possible to show the connection Dr. Teeth has with his instrument. A second puppeteer would be playing the piano with the two hands, but unlike the other puppets which have large bodies to hide the second puppeteer, the two hands seem magically disembodied. Watch Dr. Teeth's arms as he performs in this next clip. This stylistic choice results in one of the most interesting looking puppets on the show. Henson once said that he sees the Muppets as representing abstract concepts rather than actual creatures. That is certainly true with Dr. Teeth, who is piano playing incarnate.